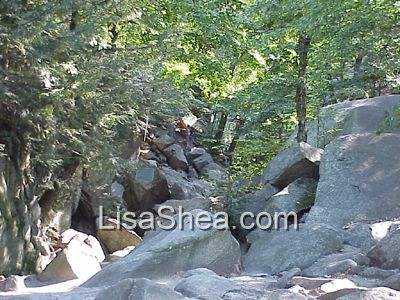 Purgatory Chasm is a natural feature that draws thousands of visitors to Sutton, Massachusetts each year. In essence it is a deep glacial cleft carved into the earth that you can walk through. There are massive piles of rocks to climb over, as well as 80 foot tall cliffs on either side when you're down in its depths. The walk through its center can be fairly challenging, while there are more gentle walking trails along either side. Purgatory Chasm has been of interest to residents of Sutton for as long as we know. This beautiful location was remarked on in the History of Sutton Volume I. It had been known to the earliest settlers. Undoubtedly the native americans who came before the colonists also knew about and were interested by this rocky cleft. While on this Google Map image they show Purgatory Chasm as the entire "top right green" area, in actuality Purgatory Chasm is just a small subset of that green area. I have marked in purple overlay where the actual Chasm and its associated paths are. So only a small section of this overall swath of green is Purgatory Chasm and its trails. 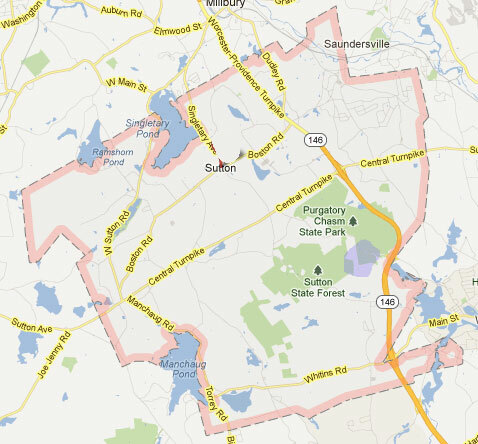 The rest of the green, which is divided up into four main chunks, is part of the larger Sutton State Forest entity. The two main access points to the overall area of Sutton State Forest are at the Purgatory Chasm entrance and at a very small entrance on Mendon Road. At the Purgatory Chasm area, on the side north of Purtagory Road there is an unmanned ranger station with a few displays, and a large parking lot. The area has a small picnic area, a playground, and a short easy walking path. The area south of Purgatory Road has its own parking and a covered picnic area as well as the main Chasm itself. There are also a few other trails along the sides of the chasm. 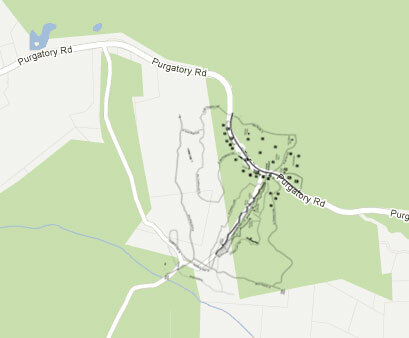 Here is a trail map of the Purgatory Chasm area. This map is oriented so that West is at the top of the map. That is, the Chasm entrance starts Northeast and heads Southwest. They have physical trail maps at the Chasm itself, in kiosks. Note that in the top left of the map, where it says "trail ends", the trail doesn't actually end there :). It continues on to Mendon Road if you keep walking on it. From there if you're willing to walk about a half mile north on Mendon Road you then reach the entrance to the Sutton Forest trail network. 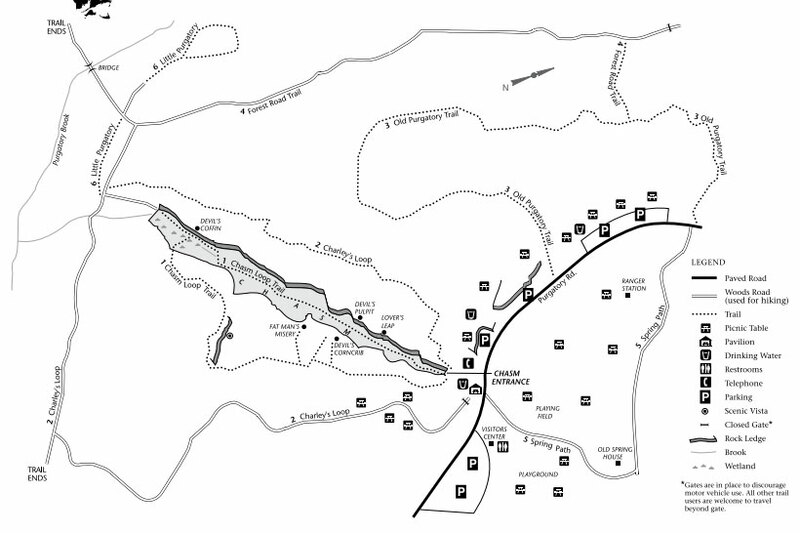 Here's an overlay of that trail map rotated properly and laid on top of the Google map, so you can see how they relate. Again, the Purgatory Chasm area is just a tiny portion of the overall Sutton Forest area. If you scroll back up, this zoomed in area is the purple area on the first map. Here is a glimpse of the type of terrain that is seen while walking down the center of Purgatory Chasm. 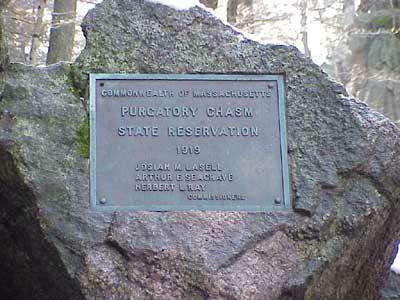 In 1919, Purgatory Chasm was designated a State Reservation. 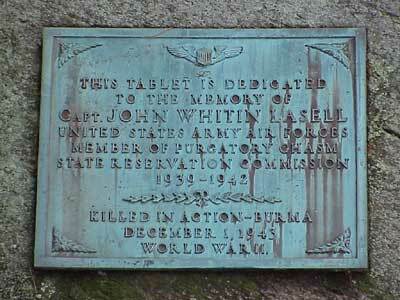 There is also a plaque for Ctp John Whitin Lasell who was a member of the commission back in the 40s, and who died in WWII. 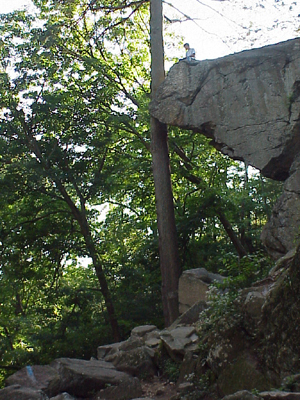 I have oodles of photos of Purgatory Chasm that I've taken over the years. Here are just a few of my photo albums, so you can get a sense of what Purgatory Chasm is all about. It's important to note that PEOPLE DIE IN THE CHASM. The latest person to die was on July 4th, 2012, when he fell 80 feet down into the chasm from an overlook. It is critical to be cautious when you walk through the chasm. Wear sturdy hiking boots. Keep your hands free. Don't carry a child!! People are injured in the chasm constantly because they are not being cautious. It's important to take this hike seriously. Even if you take the outer walking trails, don't get too close to the edge.